Pros Nice collection of synths and controls • Cons Button layout is a bit crowded • High price may scare away casual buyers • Virtual buttons, while responsive, are just not the same as physical buttons. Propellerhead Software the Swedish music software company is well known in industry circles as the creators of the DAW (Digital audio workstation) emulation software, “Reason”. The software cost multiple hundreds of dollars and was obviously geared more toward professionally song-writers and musicians. Now Propellerhead is living up to this iOS application’s name, reinventing itself on a new platform, and bringing that same expertise and functionality to the iPad, to enable another market of music makers. When you launch the application you are first prompted with some demos of Rebirth loaded with pre-programmed stuff. I highly recommend taking a few moments to play with this as it is an easy way to get familiar with all the emulated analog aspects inside Rebirth. By tweaking knobs and sliders you can immediately see the reaction of the synths to your gestures. 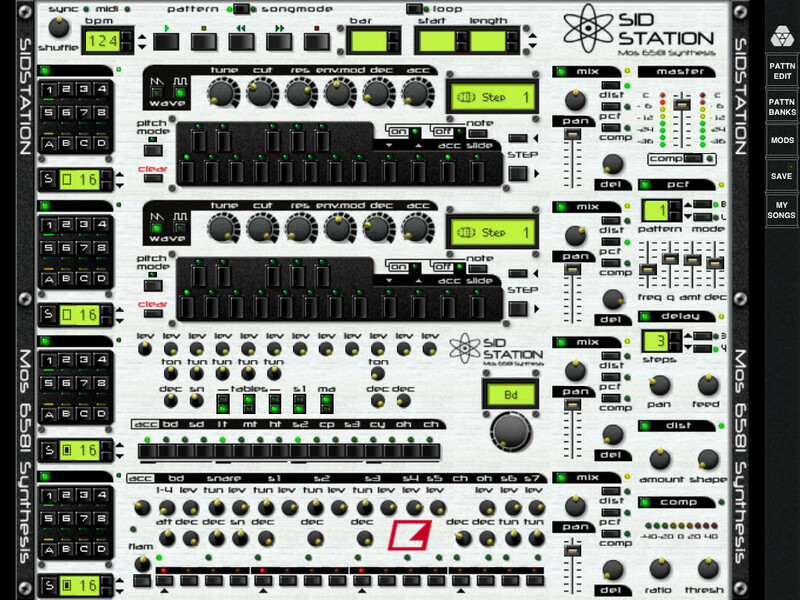 At a first glance you might be a little confused, especially if you have never seen an analog synth or drum module before. Historically they have never been easy to program, but they are not rocket science either. Start a new song and record it while you are choosing patterns (8) and banks (4) and tweaking them, then you can go back and really listen to the effects. 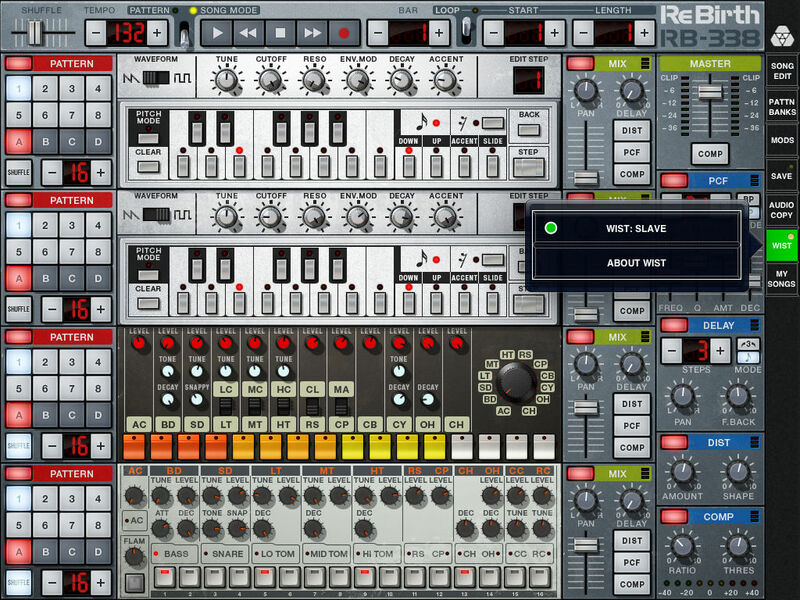 Try out every module inside of Rebirth at once or start with a nice upbeat from the TR909 and consecutively build the beat, adding on textures from the TB303. Rebirth includes and a total of 7 Mods to explore with an array of different sounds and graphical themes, but the same underlying interface. You are limited only by your inspiration and creativity. Rebirth for iPad carries the same audio quality of its desktop software predecessors from the 90s and mid 2000s. Hook your iPad to any mixer and you’ll will enjoy its sound to the fullest. If you don’t have a mixer then you can just use your headphones and you will see what I’m talking about. You will instantly notice while toying around with the TB-303 module how it reacts to Propellerhead Software’s sound shaping controls (tune, cutoff, resonance, envelope and so on) providing you with the expected fine tuning for your performance. The controls are very good, the touch screen works flawlessly for tweaking or turning knobs and sliders. Honestly, I was really surprised with the quality of the controls overall considering the crowded layout of the screen. As you can see, the iPad screen is absolutely packed with a hundred or so controls on just the single screen. However, controlling them is not an issue at all. In fact it’s actually pretty simple and intuitive. For example, if you are tweaking the tune knob on the TB-303 you simply tap it once and then flick up or down to control it. Of course, on a touch screen, a knob is not a physical knob and a slider is not a physical slider, but you will be glad to be able to play these classic synths on your compact and reliable iPad instead of having 4 pieces of analog hardware costing you and arm and a leg (that is if you can even if you can find them). If you are an electronic music enthusiast, an aspiring DJ or producer, this is an App you will love to have and try all the awesome features of Rebirth for yourself. Even if you are just thinking about getting into music as a producer and are still not sure if you will dig it, then instead of spending hundreds of dollars on equipment, pick up a copy of Rebirth for $15, have fun, and use this as an introductory lesson. Check out Martin's blog and follow him on twitter at @yourdudeness080.